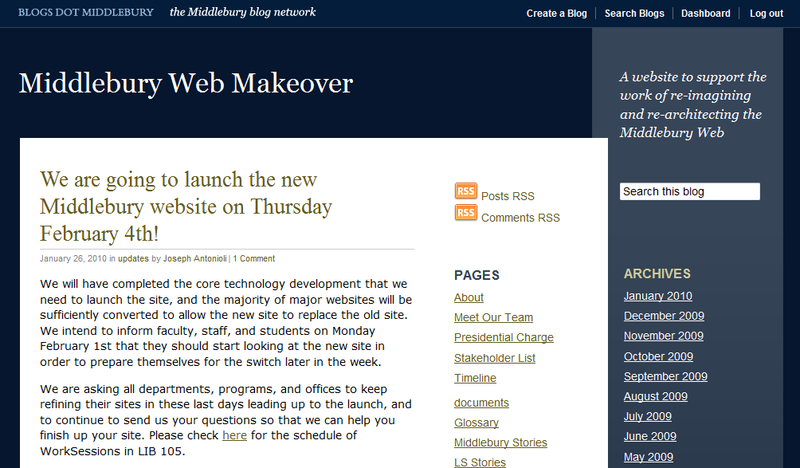 We’ve made several changes to the WordPress platform, known on-campus as sites.middlebury.edu. Hey! You’re there right now! 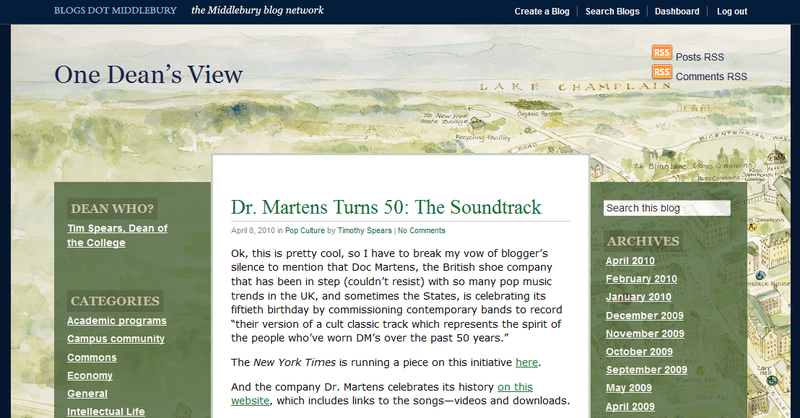 Once some Midd-specific WordPress themes are created, Middlebury’s blogs should be linked together via a unifying header or title bar element of some kind. The bar across the top of most Blogger blogs is a good example; it doesn’t interfere with the branding or messaging of the blog itself, but provides quick and consistent links back to the Blogger homepage and other blogs. 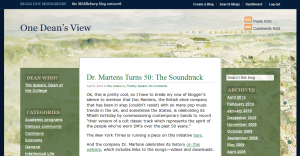 Once some Midd-specific WordPress themes are created, Middlebury’s blogs should be linked together via a unifying header or title bar element of some kind. 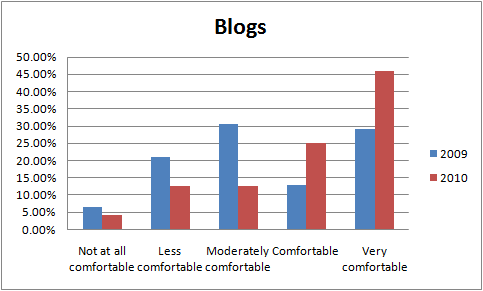 The bar across the top of most Blogger blogs is a good example; it doesn’t interfere with the branding or messaging of the blogitself, but provides quick and consistent links back to the Blogger homepage and other blogs. The logo at the top left will bring you to the home page of our blogging network. 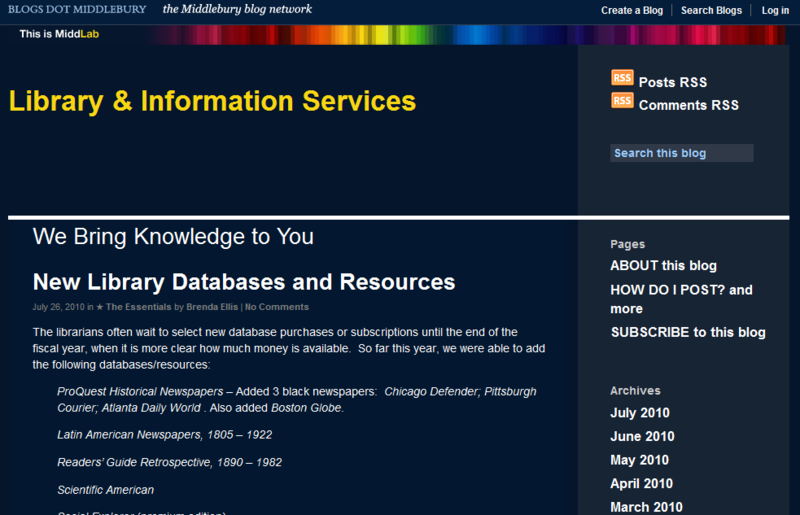 If you’d like posts from your blog to appear there, send an email to website@middlebury.edu and we’ll add you to the list. There are three new themes available on our blogging platform. These are based on designs we received from the people who put together our new site design. We put these together in a way that makes them each to set up. The catch is that there are very few configuration options for these themes. That means these are great for people who want to set up a blog quickly and aren’t interested in doing a lot of customization on the look-and-feel of their blog. Additionally, these themes do not work properly in Internet Explorer 6. As of today, only 3.06% of visitors to our blogs use this browser and we are going to recommend phasing out support. 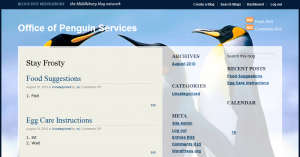 For themes that offer you a massive variety of customization options, be sure to check out the many theme options Alex Chapin has created for our blogging network. The new Navy (as in blue) theme offers a straight-forward, even minimalist, design for your blog. There is no background image on this theme, which offers two columns for you to add widgets. 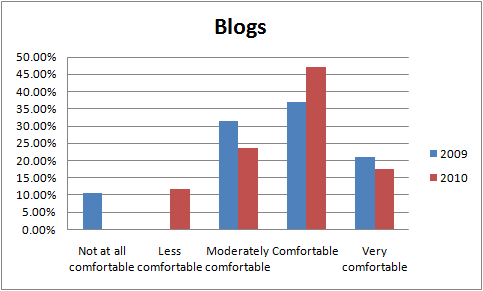 The left column only appears on pages with more than one post: the blog home page, search results, and archives. If you are viewing a single post or page on this theme, the left sidebar will disappear, giving the post more space on the page. The Pastoral theme features an image of the Bread Loaf campus as its background. This theme uses the same two-column format as the Navy theme, with the left column only appearing when more than one post is being displayed. The big difference with this theme is that you can change the background image if you like (more on that later). The Map theme uses a professionally done watercolor illustration of the campus as its default background. As with the “Pastoral” theme, you can change the background image if you like. 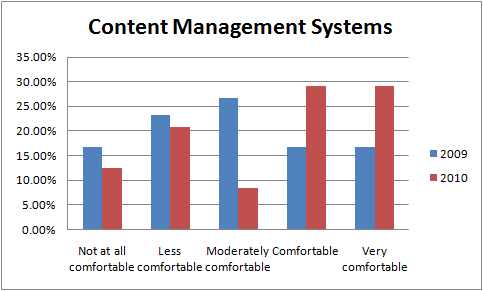 The big difference with this theme is that the left column is on the left of the blog’s content. Because of this positioning, both columns appear on all views of the blog, even when viewing a single post. Use this theme if you really like columns! We’ve also added a new theme that you can use for a research project that you would like us to feature in MiddLab. Remember to send your MiddLab project ideas to middlab@middlebury.edu and check out the site to discuss the ongoing research projects of your fellow faculty, staff and students. Click the Log in link at the top right of the page and fill in your username and password. Click the Dashboard link at the top right of the page. In the Appearance box on the left, click the Themes link. Click Activate below the picture of the theme you want to use. In the Appearance box on the left, click the Widgets link. Drag the widgets you want to use from the boxes in the center to the Left Column or Right Column boxes on the right. Middlebury’s status as a top school depends on offering the services our students require. 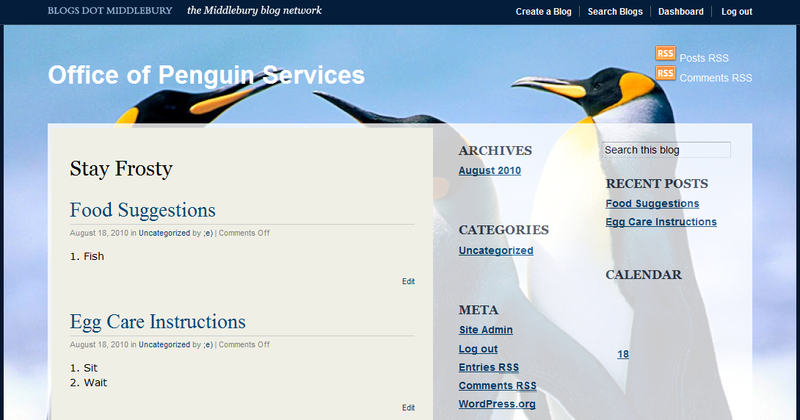 Perhaps one day Middlebury will accept penguins as applicants and you’ll be asked to create a blog for the new Office of Penguin Services and you’ll realize that you need a background image that speaks to the students you’re helping. Our themes support this. This can only be done on the Pastoral or Map themes. In the Appearance box on the left, click the Custom Header link. Click the Browse button, select the image you want to use and click OK.
You’ll be asked to crop the image you chose. Select the part of the image to use as the background and click Crop Image. This entry was posted in Midd Blogosphere and tagged Areas and Workgroups, Blogging, communication, Enterprise Applications, Web Application Development, web makeover, WordPress, ★ The Essentials on August 20, 2010 by Ian McBride. 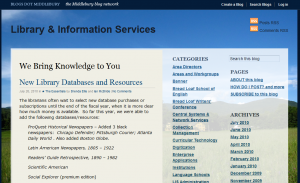 MiddLab is a new section of Middlebury’s website with no precedent: an academic network, uniting all of the… blah, blah blah. Truth is, MiddLab has been hard for us to explain ever since we heard the idea. A research network featuring discussions and blogs, and linking together disciplinary themes? How does that work? Rather than write a manifesto, here is what we’re trying to accomplish with MiddLab. Make research easy to discover. If you want to know what student and faculty research is going on in a department, you shouldn’t have to know where their papers are published or the address of the project’s web site. Instead, these should be one or two clicks from our home page. Show connections between research. Whether researching the population growth of trees in Biology or the population density of people in Geography, projects share themes and people interested in the topic can easily explore both. Start a discussion. We encourage and recommend that you add comments to the projects on this site. Ask questions, suggest new research, or explain why you disagree with the conclusions. You can add your thoughts to any project page on MiddLab, explore the individual blogs for some projects, or contact the researchers directly. Provide space for research and the sciences on our site. We’ll be expanding this site to feature more presentations from the Spring Research Symposium and research projects in our science departments. Though MiddLab is open to any student, faculty or staff projects, these are areas where we know we’re not offering enough information on our site and would like to use MiddLab to expand. We aren’t sure these are the right goals for our site. We’d like to hear from people: what would you like to see in MiddLab? What parts of this site work toward these goals and which don’t? Leave your thoughts by commenting on this page. Oh, and if you would like us to feature your project in MiddLab, send an email to middlab@middlebury.edu. This entry was posted in Midd Blogosphere and tagged Blogging, communication, Enterprise Applications, Middlebury, MIIS, students, Web Application Development, web makeover on May 12, 2010 by Ian McBride. 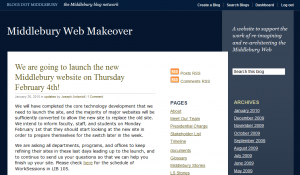 This entry was posted in Midd Blogosphere and tagged Feedback, LIS Website, surveys, web makeover on April 9, 2010 by Barbara Merz. 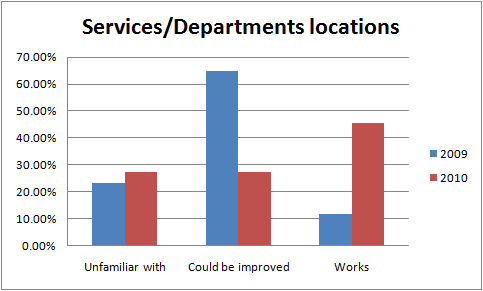 I’ve compiled the results from the LIS Website Team’s survey of LIS students workers where we asked about familiarity with areas of the LIS website and knowledge of web technologies. This was a shorter survey than the staff version with 20 students responding to the 2009 version and 17 completed 2010 surveys. 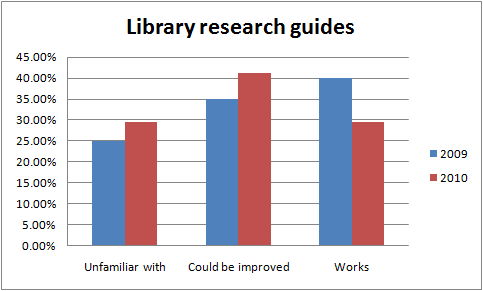 Before I present the results of the student survey, I want to share my recommendations based on the results of both surveys. These are just my initial thoughts. 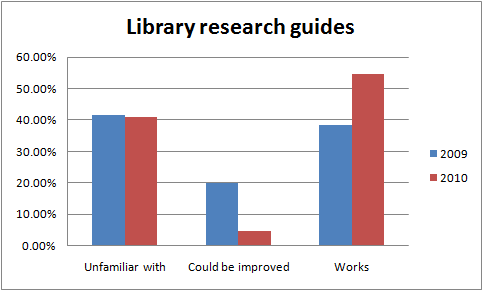 The LIS Website Team will compile its recommendations based off this data, the comments included with both surveys, and usability testing we’re conducting this month. Establish education programs for RSS, surveying and using the research guides. 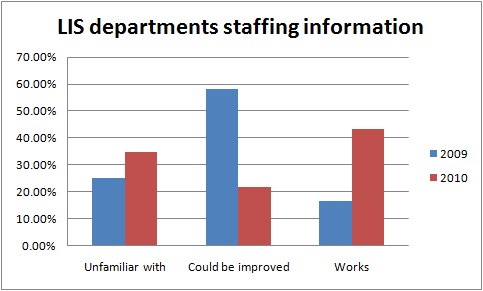 LIS will soon be forming an Education & Training team and we should recommend that this team prioritize training programs on these services, which our survey showed were unfamiliar to a large portion of LIS staff and student workers. 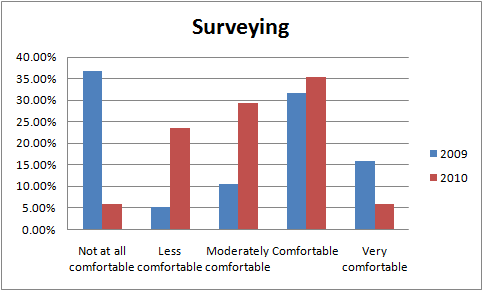 Training on surveying could include both how to use the survey tool as well as research best practices, an area where having a Faculty adviser would be very helpful. 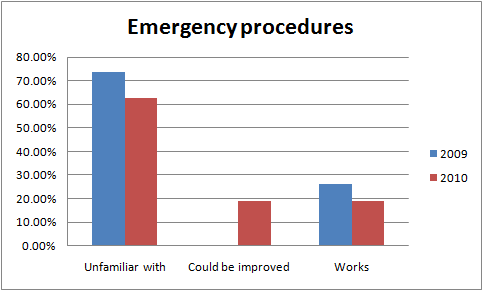 Improve visibility of the Emergency Protocols and make sure this information is up-to-date. 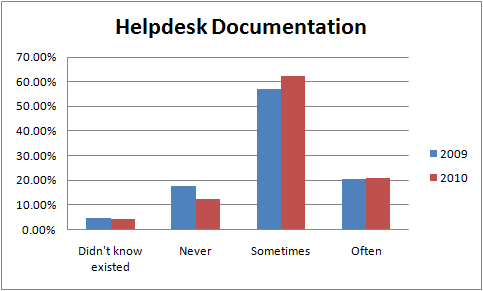 Both LIS staff and student workers were largely unfamiliar with this documentation. 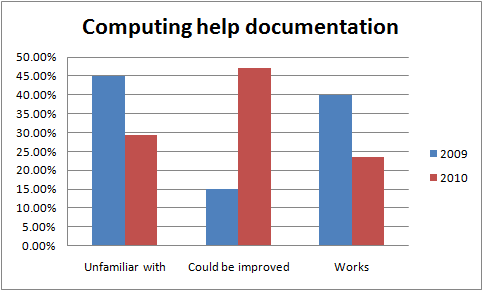 Due to its nature, we need to make sure that these documents are available and understood. 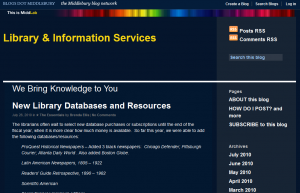 Advertise the website as a primary source for information. LIS staff reported that many people still contact them directly for information that is available on the website. 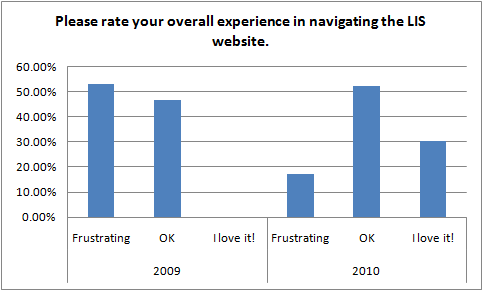 When contacted, we should refer people directly to the website to encourage people to go there first in the future. Improve the Staff Directory. With so many staffing changes in the last year, and more to come, it’s understandable that we haven’t maintained the staff directory as well as we should. Hopefully, the Identity Management project will give us new ways to automate the staff directory and more information about its structure. Make LIS event and space information more visible. We’ll be working with the Events Management Office over the summer on additional scheduling tools for the spaces managed by LIS. We need to make sure that this information is prominently featured on the website. 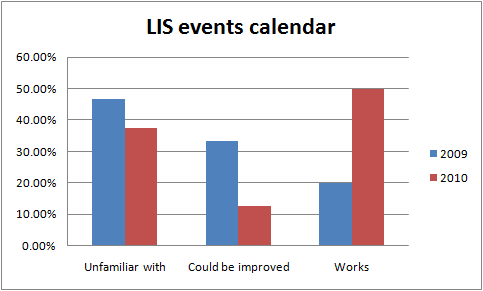 Question 2: What features of the new LIS website work or could be improved? 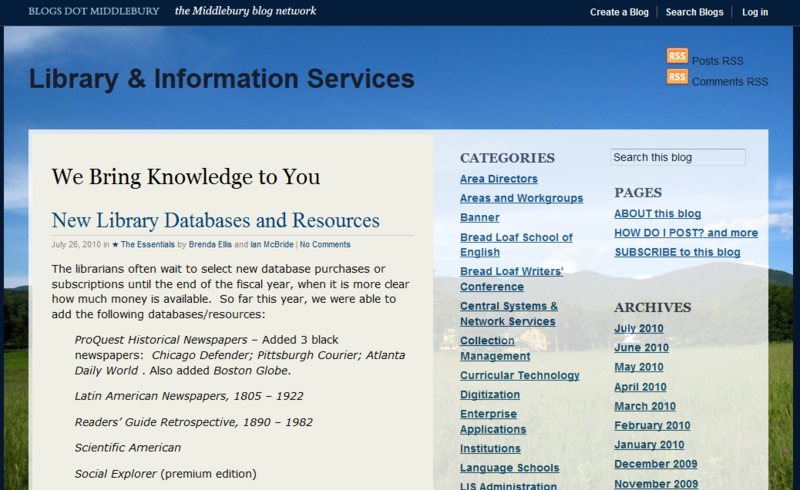 The hours of service for the library and the locations of LIS services both improved with the new site. 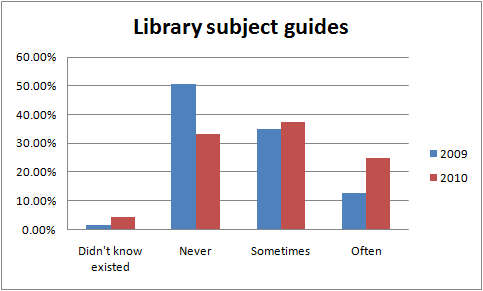 This is good, since our examination of analytics data showed that these are the most visited sections of the LIS website. 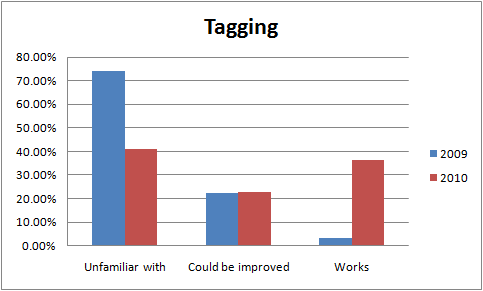 Students are still largely unfamiliar with the research guides and the tagging features of our site. Question 3: Is there information not on the LIS Website that would be useful to include? 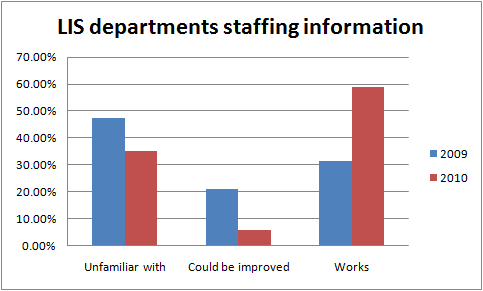 There was no change in the LIS student workers’ response to this question between the 2009 and 2010 surveys. 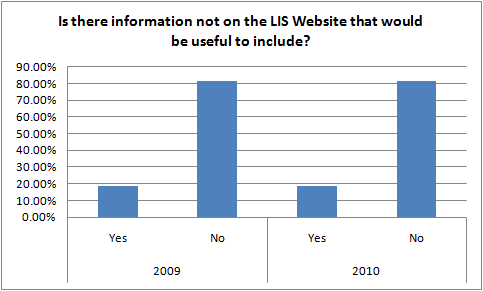 Most respondents still feel that the information that needs to be available on the LIS Website is present. 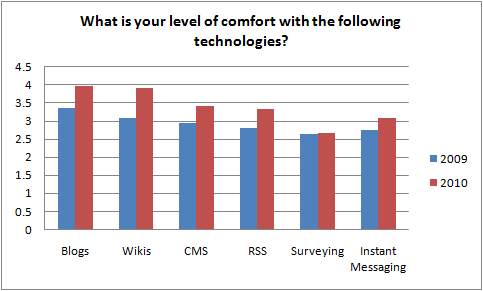 Question 4: What is your level of comfort with the following technologies? 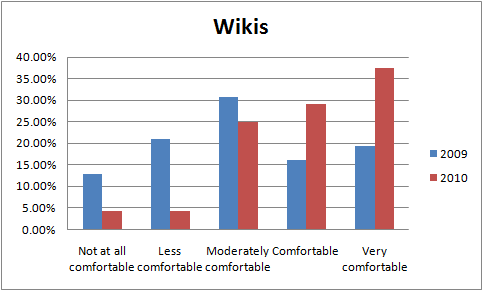 There was increase comfort with all of the technologies on the 2010 survey with the largest improvements in Blogs, Wikis, and Content Management Systems. This was expected as these were the tools used to build the new LIS website and several student workers were involved in that effort. 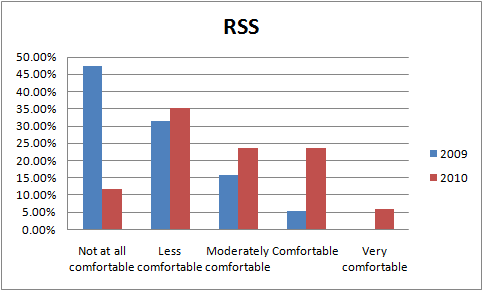 The respondents were less comfortable with RSS and surveying. This entry was posted in Midd Blogosphere and tagged Feedback, LIS Website, students, surveys, Teams, web makeover on April 8, 2010 by Ian McBride. 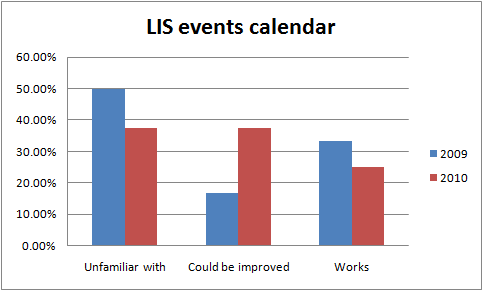 Thanks to all the LIS staff who responded to the LIS Website Team’s survey! 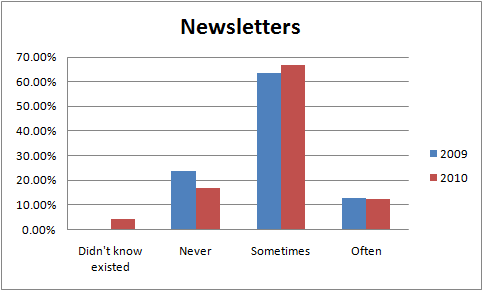 There were 63 responses to our 2009 survey, prior to the redesign of the LIS Website, and 24 responses to our more recent survey, after the launch of the new site. 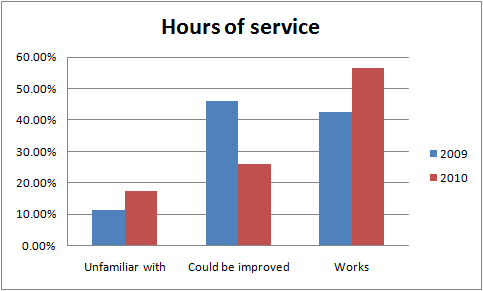 In this post, I will share some of the results of these surveys and compare the feedback between the two surveys. I’ll discuss the student survey in another post. Question 3: How important is it for you to reach each of these audiences with your web content? 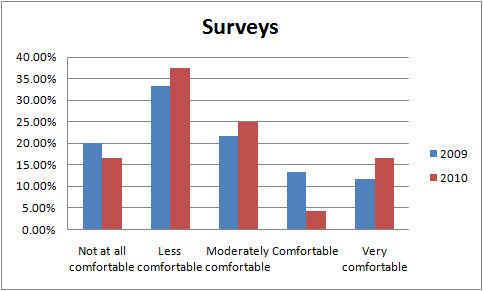 There was little change between the 2009 and 2010 surveys in which audiences LIS staff see as the primary visitors for their sites. In general, LIS staff now feel that it is less important to reach all of the audiences, but reaching students, faculty and staff remain the primary audiences. 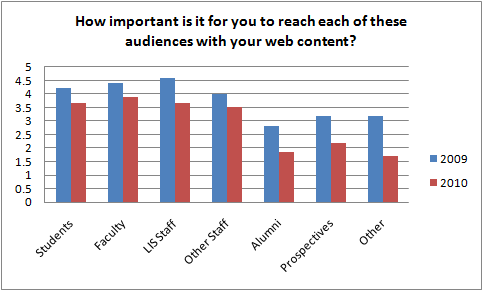 Faculty is now the most important audience, where LIS staff had been the most important audience on the 2009 survey. 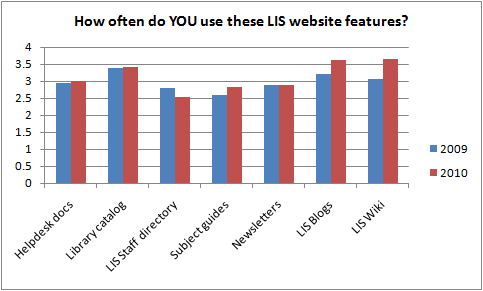 Question 5: How often do YOU use these LIS website features? 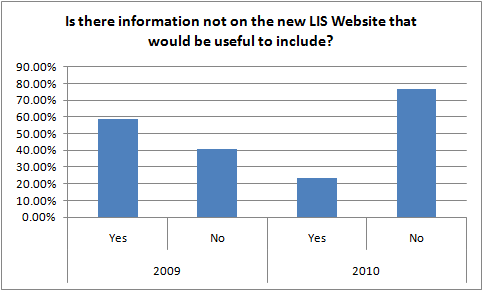 There was little change in the usage of LIS website features between the 2009 and 2010 surveys. 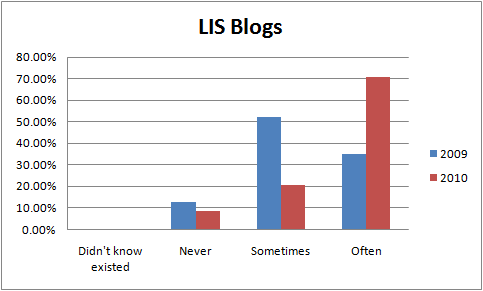 There was a slight increase in the use of LIS Blogs and the LIS Wiki, which we anticipated as we’ve focused a large amount of effort to improve both of these platforms in the last year, particularly by adding documentation to our wiki. 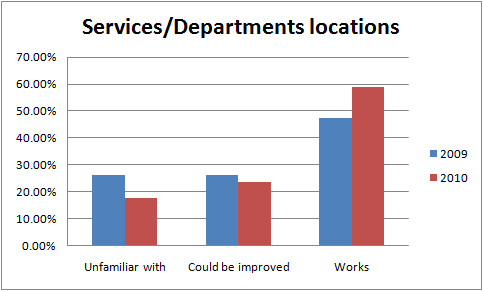 The only service that saw decreased usage was the LIS staff directory. 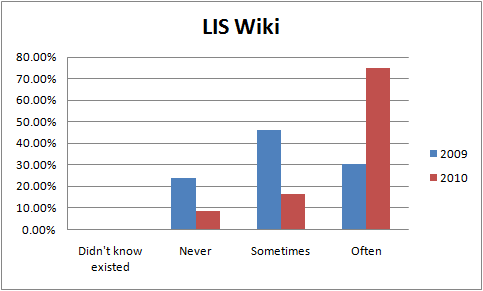 Because of the smaller number of responses on the 2010 survey, the increase usage of the LIS Blog and LIS Wiki is not noticable until you examine the responses for each category as a percentage of the total responses. This view for each of the items is shown on the charts below. 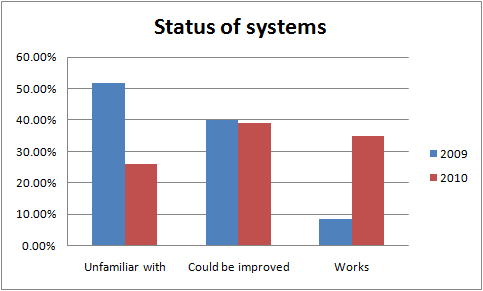 Question 6: What features of the LIS website could be improved? 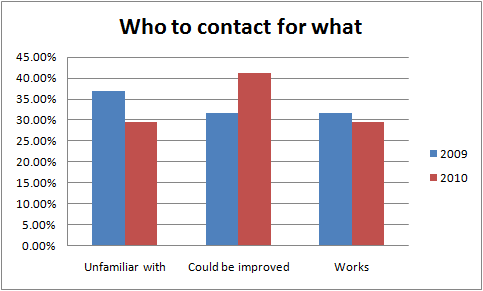 There is a clear trend with each of the responses to this question: many of the staff who felt that each of these features could be improved in 2009 now feel that these features work on our site! 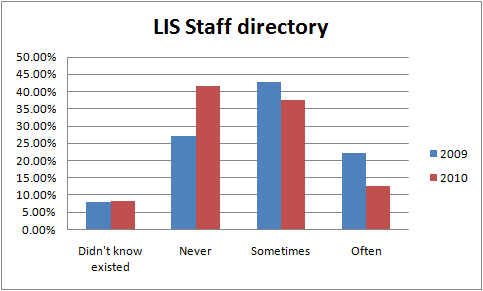 However, there remains a large segment of LIS staff who are not aware of these features of the LIS site, suggesting both that LIS staff may not visit the LIS site often and, for those who do, we need to do a better job of promoting these features. 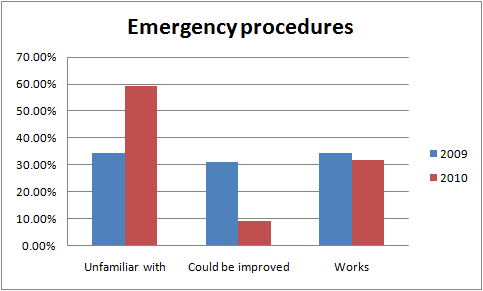 The one exception to this trend is emergency procedures, where fewer respondents in 2010 believe this section of our site works and a larger percentage are unfamiliar with this content. 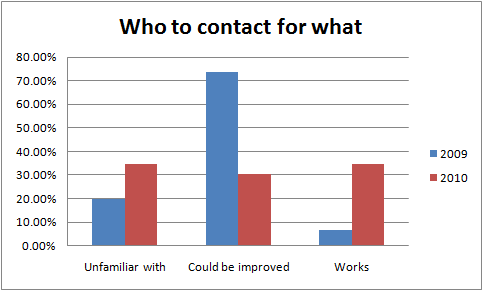 Given the nature of this information, especially its importance to LIS staff who were the subjects of these surveys, we need to focus on improving access to this information. 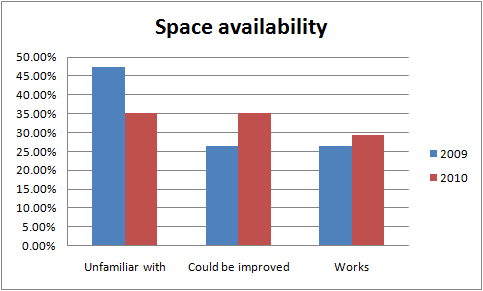 Hours of service and space availability were other areas that saw less improvement than other features of the site, though both were improved between the two survey groups. Question 7: Do users often contact you for information that is available on the website? 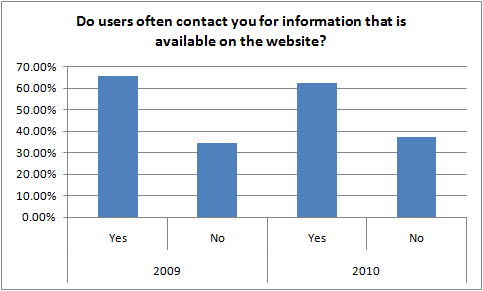 There was little change in the response to this question between 2009 and 2010, which might suggest that we need to improve advertising of the website as a primary source for information, or steer people who contact us to the website to find the information. We should ask people who contact us whether they checked the website to find this information first to determine if the issue is people not using self-service methods to get information or if the information is too difficult to find on the site. Question 8: Is there information not on the new LIS Website that would be useful to include? 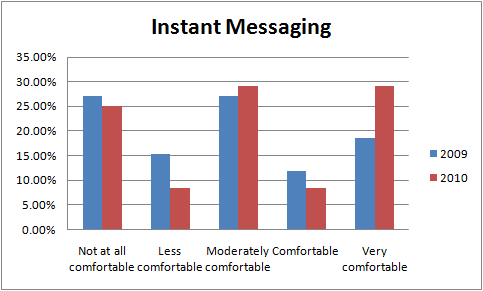 The 2010 survey shows a dramatic improvement in this metric. I believe this is a result of the process we conducted to transfer information to the new website: all information had to be transferred by hand so people doing the work put a lot of though into including only the necessary information. It’s also probable that the permissions system for our new site, which allows areas to add people to work on the site as needed, helps keep the site up-to-date as new staff can be added to work on a site. Question 9: What is your level of comfort with the following technologies? 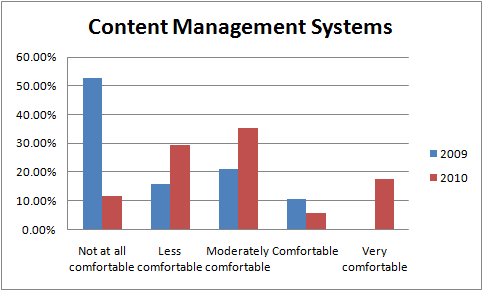 Overall, LIS staff are more comfortable with all of the technologies listed than they were in 2009. 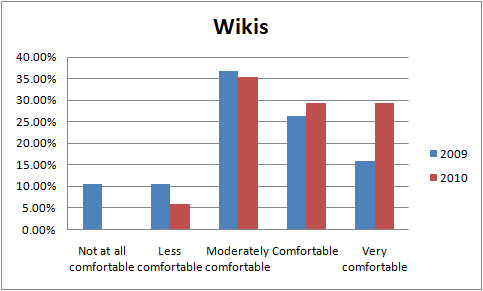 The largest growths in comfort were with Blogs and Wikis, probably as a result of their emphasized use as part of the new LIS website. 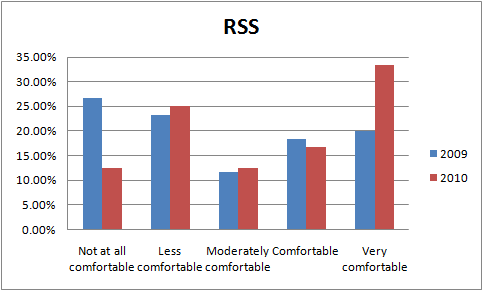 The most pronounced growth in the highest level of comfort was with the use of RSS. Question 11: Please rate your overall experience in navigating the LIS website. 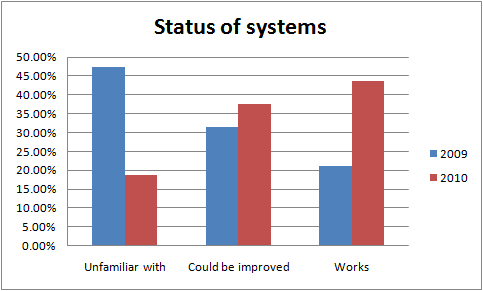 Most LIS staff still only feel ‘OK’ about navigating the website, but far fewer find it frustrating and some people actually love it now. 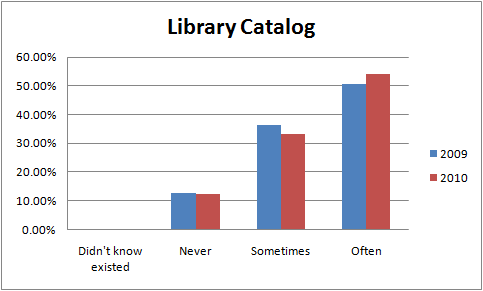 Here are exports of the data used to create these charts. 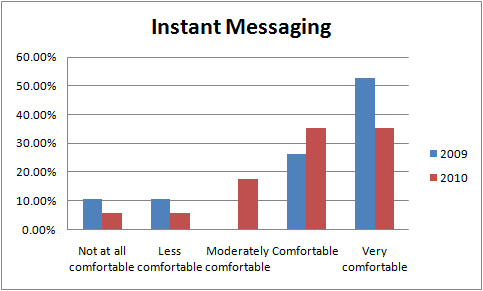 If you think I’ve misrepresented the information, please feel free to post your own results based on this data. 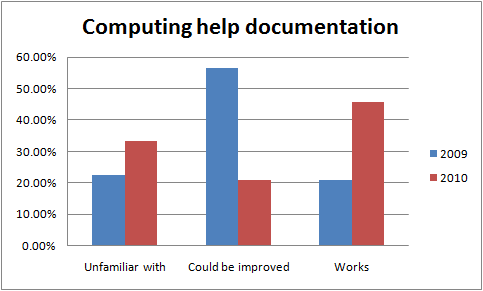 Let us know your thoughts about the survey results in the comments section here. Thanks again to all of the staff who participated! This entry was posted in Midd Blogosphere and tagged Feedback, lis staff, LIS Website, surveys, Teams, web makeover on April 7, 2010 by Ian McBride. During the week since the new website has launched you many have noticed slow page-load times, especially when logged in and saving edits. For the past week the Web Application Development team and our colleagues in Central Systems & Network Services have been working to improve the performance of the site and prevent low performance from overwhelming the servers and causing intermittent outages. We have made several fixes over the past few days that bring us out of the slow-site woods and into sunny pastures of snappy responses. 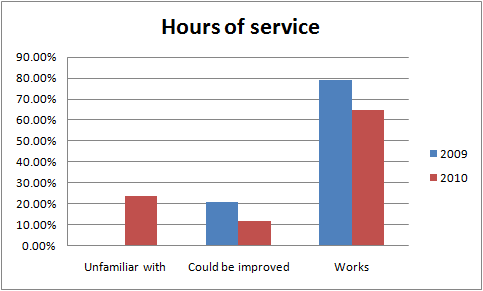 The first big change was documented by Ian in Website Improvement #1: Reducing home page load time by 80%. The second big change this week was a fix to prevent Google and other search engines from crawling a particularly slow editing page. Repeated hits to this page were overwhelming one our web-servers and slowing down requests for everyone. 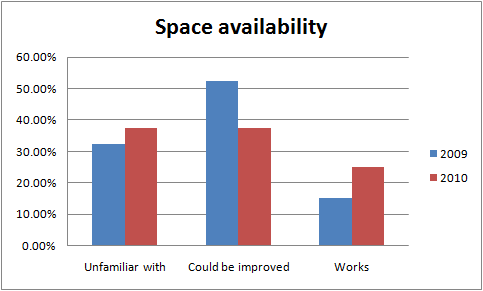 The big change today was to move the databases for other web applications off of the database-server used by Drupal. 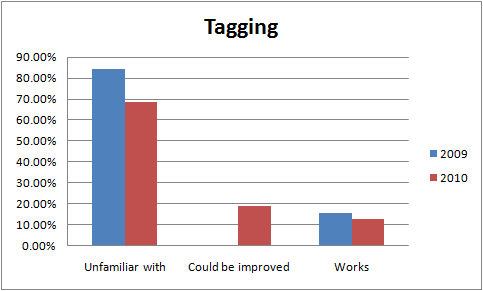 This change has drastically improved our query-cache hit-rate and been the main factor in speeding up saves and other editing operations. Travis has reworked how the Athletics-roster images were fetched from their database, improving the image-load times from 11 seconds to 12 milliseconds. The Athletics page loads much faster now. The last performance improvement this week came from a fix to the access denied page. This fix prevents browsers from periodically falling into a loop of redirects that never ended. Preventing a never-ending stream of redirects gives a better user experience when trying to access a restricted page, as well as leaves more server power available for handling pages that will load successfully. At this point authenticated users should be experiencing page-load times between 300 milliseconds and 5 seconds for almost all view and edit operations (down from a range of 2-25 seconds). Unauthenticated users should be experiencing page-load times between 20 milliseconds and 3 seconds for all page views. We plan to improve performance even further in the coming weeks, but our hope is that page speed is no longer a major impediment to performing needed tasks. Thank you to our whole community for your patience while we worked through these growing pains. This entry was posted in Midd Blogosphere and tagged Areas and Workgroups, Enterprise Technology & Infrastructure, Web Application Development, web makeover on February 12, 2010 by Adam Franco. We often use this guide as a handout in research workshops. It prints on one page, double-sided. Please use it and distribute it widely! This entry was posted in Midd Blogosphere and tagged Areas and Workgroups, research, Research & Instruction, web, web makeover on February 11, 2010 by Carrie Macfarlane.